LINCOLN, Neb. (AP) — Discovery of a 210,000-gallon oil leak from the Keystone pipeline would seem to be poor timing four days before regulators in Nebraska decide whether to allow a major expansion of the system, but officials say state law does not allow pipeline safety to be a factor in their decision. The Nebraska Public Service Commission was scheduled to rule Monday if a Keystone XL expansion pipeline proposed by TransCanada Corp. can cross the state. The commission’s decision is the last major regulatory hurdle for a project that has faced numerous local, state and federal reviews and lawsuits since it was announced in 2008. Keystone operator TransCanada Corp. shut down the existing pipeline early Thursday morning and workers were testing to determine the cause of the spill on agricultural land in Marshall County, South Dakota, near the North Dakota border, about 250 miles (402 kilometers) west of Minneapolis. State and company officials said the spill was not a threat to waterways or drinking water, but critics were quick to use the leak as an example of what they see as the risks to the environment. The Nebraska vote Monday will be on a proposed route for Keystone XL, a massive expansion that also would be operated by TransCanada. The new pipeline would carry an estimated 830,000 barrels of oil a day from the oil sands areas of Canada through Montana, South Dakota and Nebraska, where it would connect with the existing Keystone pipeline. The decision will hinge on testimony and documents generated from public hearings over the summer and from more than 500,000 public comments, Nebraska Public Service Commission spokeswoman Deb Collins said. A state law passed in 2011 prevents the commission from factoring pipeline safety or the possibility of leaks into its decisions. “The commission’s decision … will be based on the evidence in the record,” Collins said. The Keystone XL proposal has faced intense opposition in Nebraska from a coalition of environmental groups, Native American tribes and some landowners who don’t want the pipeline running through their property. Opponents of Keystone XL are incensed that the leak won’t be considered. “There is a reason TransCanada and the big oil lobby did not want this information on the record,” said Jane Kleeb, director of the Bold Alliance, a coalition of groups that have opposed the Keystone XL for nearly a decade. President Donald Trump issued a federal permit for the expansion project in March even though it had been rejected by the Obama administration. The existing Keystone pipeline, where the leak was discovered, transports crude from Canada to refineries in Illinois and a major storage hub in Oklahoma, passing through the eastern Dakotas, Nebraska, Kansas and Missouri. It can handle nearly 600,000 barrels daily, or about 23 million gallons. Since 2010, companies have reported 17 spills of oil or petroleum products in the U.S. the same size or larger than the leak announced Thursday, according to U.S. Department of Transportation records. Officials in South Dakota said they weren’t notified about the leak until roughly five hours after TransCanada discovered it. Brian Walsh, an environmental scientist manager at the South Dakota Department of Environment and Natural Resources, said officials would likely inquire about the delay but were focusing immediately on the spill. TransCanada said Friday the leak was controlled and posed no threat to public safety. The company has sent more than 75 workers to the spill site, including environmental, engineering and emergency response specialists. TransCanada spokesman Matthew John said the company will need to do “extensive testing” along with federal regulators and independent testing facilities before they can pinpoint a cause. 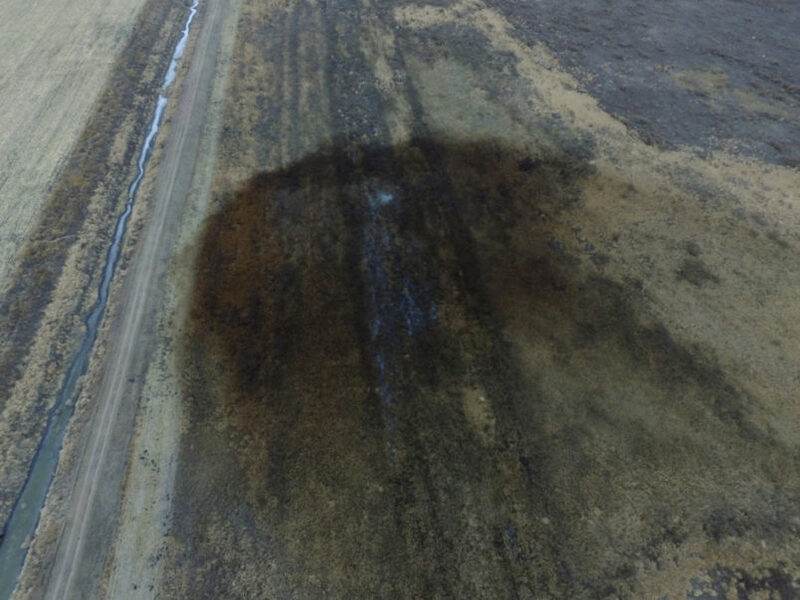 An aerial photo released by TransCanada on Twitter that the company says is of the spill, shows a darkened area on flat agricultural land. There do not appear to be any waterways or towns nearby. Residents near the site reported a surge of activity as cleanup crews arrived at the scene. Suzie Easthouse, general manager at the Front Porch in Langford, a city southeast of the spill area, said the restaurant will be catering for TransCanada workers at the site. Easthouse said she’s serving Friday supper and a middle-of-the-night shift meal for 80 people, with meals for 100 people on Saturday. “I’m pretty much going to be working a 24-hour shift here now,” Easthouse said. Easthouse said she has mixed emotions about the pipeline, a tug between the business it has brought to the area and her environmental concerns. She thinks the spill will have lasting effects in the area. This version of the story corrects that there have been 17 leaks the same size or larger than the Keystone spill instead of 17 larger than this spill. One of the spills was the same size. Nord contributed from Sioux Falls, South Dakota. Associated Press reporter Matt Brown in Billings, Montana, also contributed to this story.